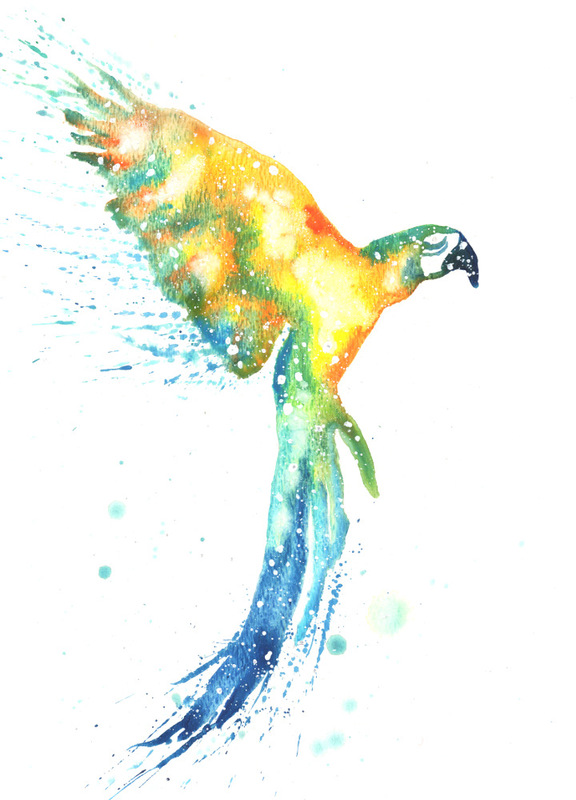 Macaw symbolizes rising, flair, and visibility. Macaws are bright, bold, and loud! It’s time to unapologetically show off your unique qualities. No more hiding. You have a skilled communicator and performer within you. Your unique flair and skills plant the seeds of inspiration in others. We need to see you being your full self to help sprout something new within us. Keep rising higher and higher. You are never “too much”. Macaw can teach you how to use your uniquely intense colors (skills) to create a new vision for yourself and others. Macaws are an endangered species. This further emphasizes their rareness. Not only are you unique, but there are even fewer people within your niche who can provide what you have to offer. So speak up and show up. Your specialties are needed. The bright primary colors of Macaws are screaming to you to be unapologetically bold and beautiful just as you are. You represent color in its purest saturated form. Pull from your color palette to create a new world for yourself and others. There’s no need to look outside yourself for inspiration. You have everything you need. Macaws wake up with the Sun and fly off early in the morning to search for food. This could indicate that you have the potential to be productive in the morning. Trying doing important tasks first thing in the day and see how it goes for you. Like many birds, macaws promote the growth of forests as they keep dropping seeds they eat. You are a planter of seeds, spreading inspiration everywhere you go. Macaws are extremely intelligent. They can learn how to unlatch cages and mimic words and sounds. You are a clever and skilled communicator/performer. Macaws use loud calls like screaming and squawking to communicate amongst themselves and draw attention. You are not “too loud” or “too much”. If anything, this is one of your gifts. Macaw is asking you to speak up more often because we could benefit from your unique viewpoint. Help draw our attention to helpful places. I want to hear about your Macaw experiences. What stories or dreams have you had? Please share and join in the conversation below! Macaws are eye catching, and interesting. I find them adoreable. 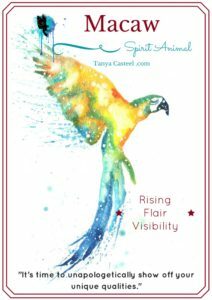 Thanks so much for this info on the macaw spirit animal Tanya ? so what l needed to hear now and incredibly pertinent! I met a beautiful soft pink macaw today while walking down the street. His color actually reminded me of the color of my auric field but I was really nervous being around him. My friend urged me to hold him and I did so fearfully! I was looking into his eyes and they really take you in when they look at you. When his mom went to take him back because it was time he ran up onto my shoulder and didn’t want to go! I have been having a tough time lately and this medicine (and your interpretation) was just what I needed to feel validated. Thank you! You’re so welcome! What a special moment you had with the soft pink Macaw. Thanks for sharing. What a beautifully mesmerizing dream. It sounds like the Hyacinth Macaw is wanting to form a relationship with you. Asking you to notice your own inner beauty and shine brighter for all of us to enjoy. Like my dream is just moving into my waking life in the most bizarre way. What do you read in all this? Thanks!! Wow, yes, it sounds like your dream was speaking to you in your waking life. I’m glad you’re paying attention and stopped to ask that man about his parrot (which can bring up the potential for you to make connections for yourself). As for what it means, it’s hard to know. You know yourself best and have more layers of information than this story provides. I find it fascinating that the bird was referred to as a 2-year-old and sad that it was losing its feathers due to the stress of losing its family. It’s not important to know exactly what it means (for no one can know the full truth of anything) but it’s great to gather information, watch what feelings and reflections come up for you, and stay curious. I hope Macaw continues to visit you. Thank you for sharing. As I was meditating this morning, I saw a macaw with sooty feathers, could still kind of see the colors and was flying toward the east. What’s that mean?